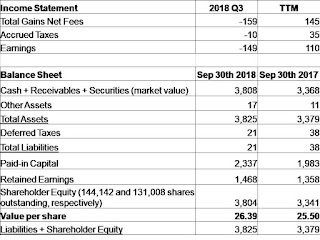 For the third quarter ended September 30th, 2018, KVF lost $1.04 per share, decreasing the value of each share to $26.39. The fund basically almost erased its gains from last quarter, while the S&P/TSX was also down in the low single digits and the S&P 500 was up in the mid-single digits. Over the last few years, KVF's returns have been driven by the absence of huge losses. That streak came to an abrupt halt this quarter, as one of the fund's larger positions saw the arrest of its Chairman, founder and CEO...for fraud. As one can imagine, that had a devastating effect on the share price, which is down more than 70% from its price at the end of last quarter. I'll have more to say on this company once the dust settles. KVF also experienced permanent losses this quarter due to the business activities of Nuvo Pharma, as previously discussed here. Mitigating these losses were gains in Viemed and Aimia preferreds (discussed here and here, respectively) in which KVF no longer has any positions. 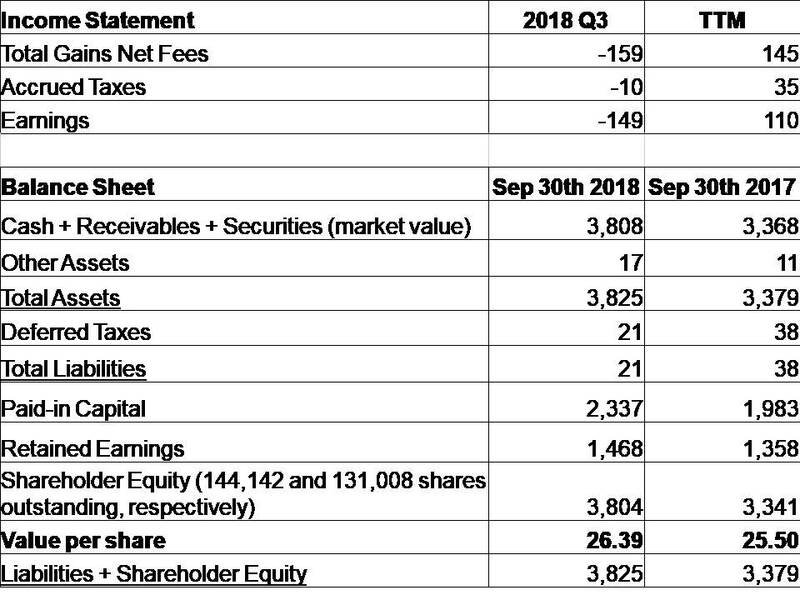 Performances of the stocks in KVF's portfolio were better than the headline number suggests, however, as adverse currency changes made up $0.35 of this quarter's per-share losses. KVF has benefited from currency gains over the last few years as the Canadian dollar has weakened; now that the dollar is strengthening, it appears time to give some of those gains back. KVF has suffered through a number of periods of underperformance in its short history, and I can confidently assert that it will do so again. The strategy has produced excellent returns over the long-term, however, and will not be changed. KVF will continue to own a diversified portfolio of businesses priced at low multiples and at what are deemed to be discounts to their intrinsic values. I read your blog since i long time , i would like to thank you for your amazing analysis. Also i would like to know when your fund will be public ? Unfortunately, securities regulations require costly expenditures in my jurisdiction, so I don't foresee it happening too soon!